In 2008, at the age of 24, Aaron Teel was paralyzed in a hit and run car accident leaving him instantly a C6 quadriplegic (with no movement from his chest down), and was told he would not walk again. Despite the prognosis, Aaron made a definitive goal to do just that. His goal is to get back to life like it was before the accident…to be able to play soccer, surf, golf, snowboard and skateboard. Aaron has remained laser-focused on that goal, so much so that in 2009 he located back to Central Florida to attend an intensive activity-based recovery program at Project Walk Orlando (www.projectwalkorlando.org Liza Riedel, Founder and Executive Director of Project Walk Orlando, and the mother of a young adult living with a spinal cord injury, says that most of their clients are facing similar situations as Aaron’s when they come to them.They are seeking ‘out-of-the-box’ alternatives; something other than what the ‘system’ pushes them towards–spending their lives in their wheelchairs, with no hope of getting out of them. 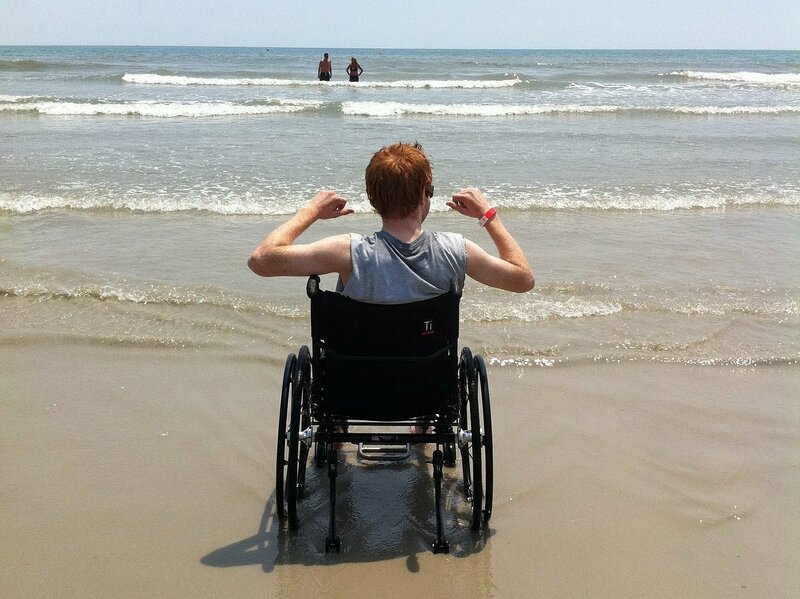 Aaron’s continued dedication with the aggressive therapy has helped him make significant gains toward his recovery. Today he is able to live independently—even drive his own car. But despite the program’s notable benefits, it is not covered by insurance. 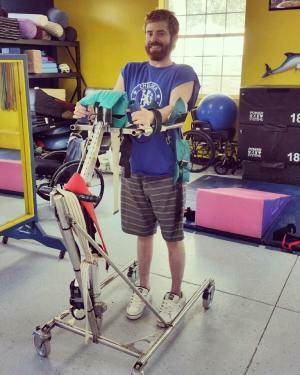 To help offset his uninsured medical costs, like therapy at Project Walk, Aaron and his family maintain a fundraising campaign with the nonprofit HelpHOPELive, relying on fundraiser events to help bridge the financial gap between what insurance will pay and what is actually needed to heal, live and thrive after injury. In support of this mission, Aaron and his family host an Annual Spaghetti Cook-Off fundraiser in Orlando. The sauce contest and event are open to the public. Proceeds benefit the HelpHOPELive Southeast Spinal Cord Injury Fund in honor of Aaron Teel. For more information on the annual event, visit www.spaghetticookoff.wordpress.com. Not able to make the event, but still want to help? Tax-deductible donations “in honor of Aaron Teel” can be made online by clicking the yellow “Donate Now” button on this page. You may also call 800.642.8399 or mail a check directly to HelpHOPELive: 2 Radnor Corporate Ctr., 100 Matsonford Road, Suite. 100, Radnor, PA 19087. If mailing a check, be sure to note “In Honor of Aaron Teel” in the memo section. Mark your calendars for Saturday, April 2, 2016 for the 7th Annual Spaghetti Cook-Off! Now in its seventh year, the annual event features an endless pasta dinner (partially sponsored by Barilla), a sauce cook-off contest and more! Open to the public, entrance donation is $25 per adult and $10 per child, which includes dinner, 1 drink ticket and 1 sauce cook-off voting ticket. Register early by clicking the yellow “Register” button below! It’s back!!!! The 3rd Annual Spaghetti Cook-off is scheduled for Saturday, April 30th, 2011 (that’s after Easter and before Mother’s day). The event will include the sauce competition, raffle prizes, silent auction, live music, endless pasta and both adult and kid-friendly beverages. The auction and raffle prizes have started to arrive and will be phenomenal as always! The event will feature live music, but let’s not forget the sauces. The competition promises to be fierce this year with likely repeat contestants. Will any new-comers step up and dominate the veteran sauces? Glad to be a part of your Special Unity (Dan & Paula) and to be able to help Aaron! Glad you've finally moved to Orlando! Keep up the hard work at Step It Up!!! Hey Aaron! That''s awesome news about your hip flexors making a move and that WFL has finally landed on a date to get you back to in-patient!!! I guess this means Naked Man is making a come back???? Hi Aaron, It is the Lovelace family once again saying a big HELLO to you! I am so sorry that it has taken me so long to mail our check out to you, but it will be in the mail today. We saw your new photo and you look healthier now. We are saying prayers for your recovery. Much love to you Aaron! The Lovelace Family Orlando, Fl. Hi Aaron!! It was so nice to talk with you over the weekend!! I can't tell you how hard you made me laugh. Teel has sent me some of the fabulous photos of you....Very Zoolander! I also wanted to let you know that we raised $220.00 for you!!! Hope to see you soon!!! Aaron - I work with your Dad and been following your courageous recovery. Keep up the good spirits and remember that the goods day will out number the bad ones. You are an inspiration to us all and we wish you continued success in recovery, and life. Nothing in life which is worth having comes easy, so keep your spirits high and fight through the pain. You will succeed. O-town 4 Aaron's 4 Limbs, fundraiser to benefit the NTAF in honor of Aaron, personally hosted by Ron Palmer, Chief Executive & General Manager of Palmer, Reifler & Associates, P.A. is being held on Wed, June 18th, 2008 at Wall Street Plaza's Slingapour's in downtown Orlando!!!! The event begins at 5:30 p.m and will last until around 10:00 p.m. The cost of entry is $25.00/head (children admitted free). There will be live entertainment, a silent auction & a raffle. For more info or to RSVP contact Melanie Teel, [email protected], 407.875.3400 ext 138. This will be a fun event and a great way to raise funds on Aaron's behalf!!!! Hi Aaron, Just wanted to check in and say hello! I also wanted you to know that we are having a fundraiser at Paychex for you on May 8 and May 23. Hope to see you soon!! Tina, Ben, David and Rachael Lovelace Orlando, Fl. Aaron, I'm so proud to be your dad. I only wish I had the patience and the fortitude to push through a challenge like the one you're experiencing. I've not always been so pleased with your stubborn and super-focused attitude and personality. In this situation, it serves you well and I'm so glad you have those traits to use. I'll always love you and will always strive to be there when you need me. Your ability to persevere is a beacon for me to follow in my journey through life's trials. Thank you. Aaron, Yes - we're another Wakulla couple that met you when you were there a couple years ago. Bob and Brenda.... Bob has a son named Aaron also. Your Newlsetter and comments and attitude through this ordeal have been amazing...and really touch the hearts of us all. We wish the best in your recovery process - do NOT LOSE FAITH, and you will overcome. God bless. Bob & Brenda Elmquist, Apopka, Fl. Hello Aaron, I am a friend to your Aunt Debbie in Maryland and consequently, a friend of your Mom, Diana. Although I have not had the pleasure of meeting of you, please know that I am praying for you, your family and Gods will for your recovery. I am amazed and inspired by your great attitude and your zest for recovery. I am also very impressed with your heartfelt, informative newsletters; I really enjoyed reading them. Please know that My sincerest wishes and prayers will continue to be with you. Aaron, We didn't know about your accident for about five weeks. Suzanne emailed me in early March. Since then I have emailed with Jeff, Jerry, and your mother in an attempt to keep in touch. Ginger sent me your first two newsletters and those have been very informative. I just discovered this guestbook and enjoyed reading all the notes that your family and friends have written to you. Please know that many people in the Union Springs area are praying for you. I have placed you on prayer lists at several churchs and have emailed your newsletters to many in my address book. Your strong, determined, positive faith comes not only from your mother but from her mother as well. Aunt Virginia was an amazing person and I feel sure that she is "in charge" of someone or something in Heaven. Aaron we are praying for you at the church! Your newsletters are an inspiration. Keep working hard and God will take care of you through it all! Hello Aaron, my name is Stephen and I am not for sure if you will remember me since I have not worked at Sea World!!! Still not for sure, I was also the guy you taught say "is that chez"? Still puzzled? You know, the guy from the Cheesecake factory you met when we watched all those idiots trying to parallel park? Man, that is still funny today…… Anyways, I wanted to share how proud I am of your positive attitude during this challenge in your life. In addition, just in case your sister has not told you, she is very proud of you and your strength as well. By the way, congrats on getting to go home as I am sure you are excited to get back to a familiar place. Take care and start training for Wii bowling so we can play a match soon!!! Hi again Aaron, Just wanted to stop by and let you know I am thinking about you everyday!! I am so happy that you are able to go home soon, that will be so nice. I also read that the halo is coming off soon...only a few weeks to go!! Keep up the wonderful work!!!! P.S. Do you think the rehab staff are going to be ok without you? From what Teel tells me you make their day!! Hi Aaron, I have read your writings with interest and have Melanie to thank for letting those of us who haven't met you feel like we know you a little bit now. Hats off to you for the ongoing tremendous display of courage and positive vibes - it truly makes a difference, as I'm sure you know. Here's a good quote: "Any fact facing us is not as important as our attitude toward it, for that determines our success or failure." Some guy named Peale said that. Look to the future, my friend. The future will take good care of you if you take good care of yourself. Best of luck in your ongoing recovery!! Hey, Man! Hope you are working on that rehab and gearing up for our night at Dirty Joe's and Trader John's (heard it was open again). Your sis and I are off to the Philippines in two weeks, and I promise to take excellent care of her (or maybe the other way around! I miss Pensacola from my Navy days and will come visit you at some point after we get back. Keep me posted on how you're doing! Hi Aaron! Teel has kept me updated on your progress as well as your crazy antics at rehab. I am absolutely amazed by your attitude and determination. You are one of the strongest most people I know! I can not even tell you how may people that you do not know have been inspired by you. Keep working hard, making people laugh and smiling, I will even give you permission to make the angry cat noise, but please use it with caution! You are in my thoughts and prays! Keep up the great work and wonderful attitude! P.S. When you get out of there we will have to go back to Cocoa and see how that girl's baby is doing....dancing around I'm sure. Aaron, I work with your father and have been truly inspired by your spirit and determination as you travel down the path of life. I have had a rough year myself with numerous operations, cancer, a heart attack and a stroke and have come through it fairly good condition physically and mentally (although Dan would probably challenge me on the latter!). To get where I am from where I have come was not an easy task but I learned very well that spirit and attitude are equal partners in making the best of any difficult situation. From listening to Dan talk about you it is apparent that you are a truly amazing individual with an incrediable attitude and I and can't express enough my admiration for your outlook and approach to recovery. It is truly inspiring and I wish for you nothing but the best. Hello, Aaron! We were thrilled to read above that you are doing well and will be released soon to continue your progress at home!! That's great news! We, too, really appreciated your informative newsletter, since we all have so many questions!! (Dan's been wonderful!) You are blessed with a great family and circle of friends, and all their prayers appear to be working!! Keep up the good work ... and see you at Wakulla 2008?! Aaron--Kathy, the girls and myself just got the news last nite when we saw your Dad at Soccer Practice. Our prayers and thoughts are with you and you are truly a courageous young man to weather this storm with such a positive attitude--an inspiration for all of us. Take Care and we hope to see you soon as you continue to progress. Aaron, I am inspired by your attitude. You are truly courageous and hopefully destined to overcome this terrible situation. You'll probably remember me by my "bouncing jello shots" at Wakulla!!! You were one who did not make fun of my jello shots and enjoyed "chewing" a few!!! :) My thoughts and prayers are with you. Don't give up! And, thank you and your dad for keeping us all informed. I know I really appreciate knowing about your progress. Best wishes always, Betty Virgili (Emily's sister) P.S. I've gotten much better at making jello shots!! They don't bounce anymore! !